The Intrepid 430 Sport Yacht may be designed as much for cruising as fishing, but it can still tame tuna. A 130 mile round trip and 14 hours afloat on the open Atlantic on an Intrepid 430 Sport Yacht? That would provide one heck of a thorough boat review experience. But to make it happen, I’d have to roll out of bed when most people were just sliding under the covers—or not go to bed at all, because to be ready for a 2:30 AM departure I’d have to leave home by midnight and drive over two hours to the inlet. And that's exactly what I did. Because the yellowfin tuna were snapping in Baltimore Canyon at first light, and I wasn't going to miss it. Great fishing on a cushy cruising yacht—now that's my kind of boat test. The Intrepid 430 Sport Yacht certainly fits the bill as a high-performance luxury machine. But can it fish? 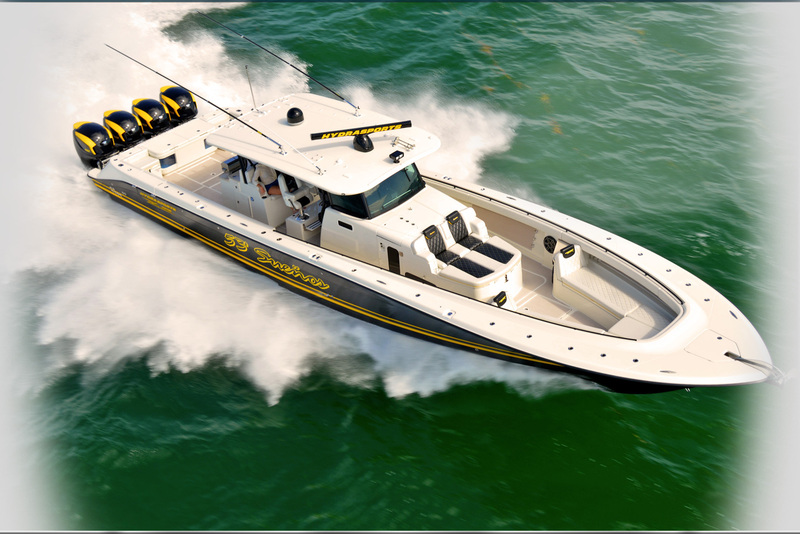 The 430 Sport Yacht may be a yacht, but it’s also designed to get the job done as a fishing boat. If you’re a long-time boater, you probably already know that boats with split personalities rarely handle all of their jobs well. The sacrifices and trade-offs that have to be made commonly result in a design that’s mediocre for most purposes, and exceptional for few. And with the vast majority of its footprint dedicated to seating, cabin, and helm-deck, it's obvious that the 430 Sport Yacht tilts more towards cruising than fishing. 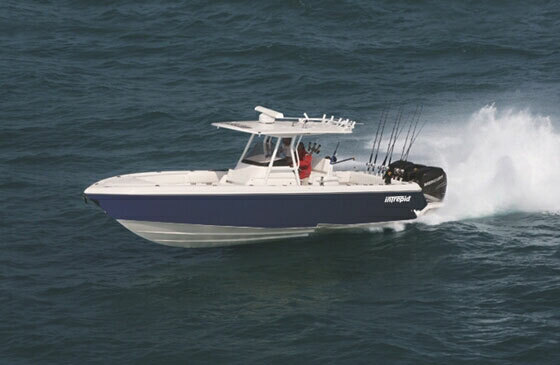 Yes, it does excel when it comes to comfort, performance, and entertaining—more about that later—so the real question I needed to answer was just how good a fishboat this multi-purpose machine would be. Dozing in the mid-cabin stateroom berth wasn’t easy while running at 35 MPH through three to four foot seas with a seven-second period, so at the first audible change in engine pitch I was out of the cabin and on the helm-deck. There was a crack of light on the eastern horizon as the three other bleary-eyed anglers and I filed into the cockpit to set lines, and my first lesson on the downsides to running a serious fishing trip on the 430 Sport Yacht quickly became apparent: despite the boat’s bodacious LOA, the cockpit is relatively tight. With four of us back there, deploying our lines included plenty of bobbing and weaving. The flip side, of course, is that you can load this boat for day cruises and joyrides. The generous helm-deck has seating for up to eight people, several more can hang out in the cockpit, and another handful of passengers can sit on the cabin settees. So while you’ll probably want to cap the fishing crew at six, you’ll have no problem hauling a dozen or more people out onto the bay for a round of Sundowners. Despite its cruising proclivity, our test boat, the Forever Young, was rigged for serious offshore trolling. It sported outriggers plus a center rigger, a rack of vertical holders on the transom, rocket launchers on the hard-top, and three rod holders down each gunwale. We had no problem deploying an eight line spread, and could have crammed in another line or two had we needed to. 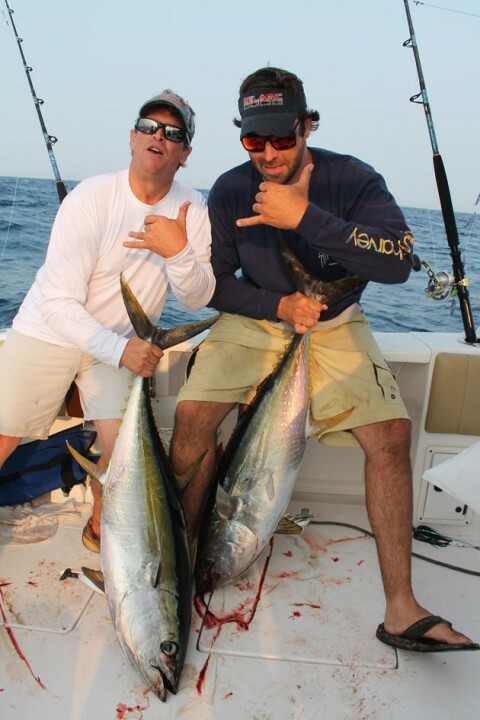 The Intrepid 430 Sport Yacht strikes first blood—a pair of yellowfin tuna. We did not need to. Before long an outrigger clip popped open, a rod bent down, and the fight was on. As the gaff-man on the first two fish, I learned that while the cockpit may be relatively tight for a 40-plus-footer, it’s big enough for a proper endgame. When the angler slides forward and the wire-man steps into position next to him, there’s still enough room for the gaffer to push up against the coaming bolsters just in front of the transom and seal the deal. This is a critical ability for offshore anglers, one that’s often hindered on other fisher-cruisers by cockpit designs that are wide enough but not nearly long enough. After swinging a pair of 40-pounders over the gunwales, I handed off the gaff and took on a new responsibility: documenting the boat’s angling abilities on video, to give you a first-hand look at tuna fishing on an Intrepid 430 Sport Yacht. Click on the photo to watch (and make sure you're paying attention to the rod sitting in the holder on the left side of the screen at 0:49). Another area where many multi-purpose fishing boats fall short is fish stowage. But the 430 excels in this regard, with a pair of fishboxes in the cockpit that run forward under the deck. We packed six 40 pound-class yellowfin, two 10 pound mahi-mahi, two 25 pound flats of butterfish, and 120 pounds of ice into just one of those boxes. As you’d expect from a top-tier builder like Intrepid, the fishbox hatches are gasketed, guttered, and swing open on gas-assist struts. While watching the video you might have caught a glimpse or two of some of the other fishy highlights on the Forever Young: a livewell with viewing port, a tackle/rigging station with drawers and a sink, both transom and dive-style gunwale doors, and a raw/freshwater washdown. The washdown is hidden behind a small door in the port inwale, which is nice because it’s out of the way, but I’m not a fan of the electric push-button hose winder. It’s actually quite difficult to pull the hose out, and IMHO the electric winder also makes things unnecessarily complex; I’ll take the standard-issue HoseCoil any day of the week. With fish in the box and footage in the camera, I had some downtime. And to my own surprise, I found some of the cruising comforts on the 430 Sport Yacht quite enjoyable. Stepping into the air-conditioned helm-deck was more than just refreshing, it was rejuvenating. Kicking back on a poofy settee is something I most certainly don’t associate with tuna fishing, but in this case, it was a godsend for my tired back. And the ability to walk into the cabin and enjoy a hot cup of coffee… ahhhhh. Okay, I admit it - the high cushy factor is nice, even on for a dedicated fish-head. We spent the early afternoon deep-dropping for golden tilefish. I noticed that it’s comfortable to sit on the cabin-top, brace your legs against the walkaround tow-kick, and drop a line from up forward. But what I learned that’s more important is that you won’t find one iota of chintz on the Intrepid. When I braced against the bowrail instead of the toe-kick it didn’t give, and when I accidentally stepped on the cabin skylight it didn’t flex. Even on the most expensive, well-built boats, I almost always find a few cheap parts to beef about. After 14 hours on this boat, I can’t point to a single one. Same goes for the hull, deck, liners, and fiberglass parts. The entire boat is resin-infused and/or vacuum-bagged, which minimizes weight while maximizing strength by ensuring the ideal resin-to-fiberglass ratios. PVC coring is used throughout, which again saves on weight while improving stiffness. 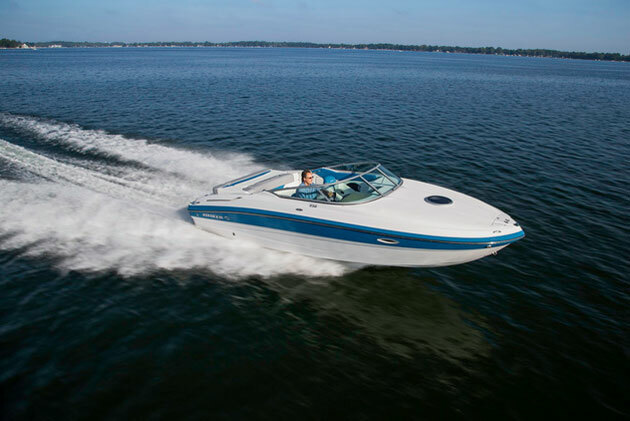 Resin-impregnated composites are utilized for the stringer system, and resins used throughout the boat are the pricier but superior epoxy vinyl-esters. Net result? This boat is tough. Seriously tough. 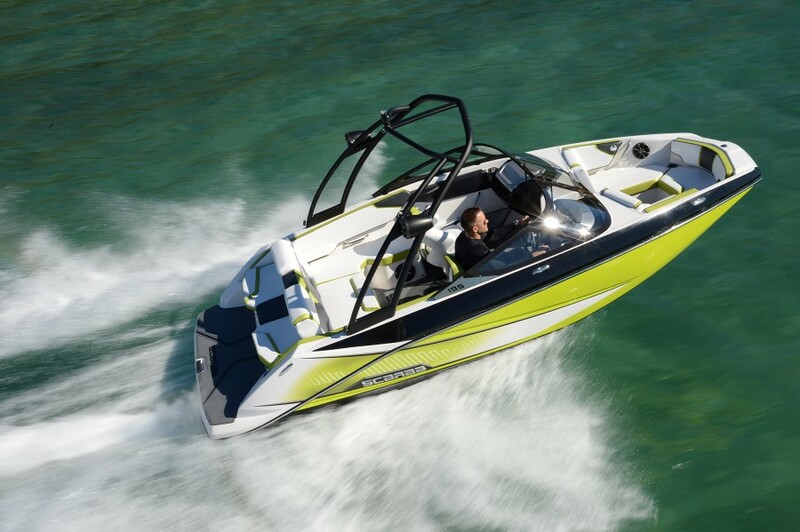 Note, however, that when you combine lightweight and gobs of horsepower—Forever Young sported triple Yamaha F350 V8 outboards—you can go fast enough to launch and pound on pretty much any wave. We had calm conditions for some of the day, but both early and late, a 15 to 18 MPH breeze stacked up a fairly tight three to four foot chop. Cruising into it at 30 MPH was comfortable, but at 35, we started going airborne. On calm days, you’ll dust 90 percent of the fleet in this boat. Between the lightweight, twin-stepped hull, and the oodles of horsepower, the 430 Sport Yacht can cruise at over 40 MPH. Mash the throttles against the helm, and you’ll top 55 MPH. What about the rest of the cabin, and its cruising accoutrements? Shouldn’t we talk about the stand-up head with its separate stall shower? The galley with its microwave, refrigerator, sink, and simulated-granite countertops? And what about the flat-screen TV? Truth be told you can see all this stuff on Intrepid’s website (they have a great selection of photos that pop up when you hover over each feature on the list), and if you’re serious about buying a 430 Sport Yacht, you’ll go see one in person at some point. (Note to self: make sure you have $650K or so ready to spend.) You can touch and feel these things for yourself, and listing them all out really wasn’t the purpose of this review. The mission here was to bring you a firsthand experience of one aspect you aren’t likely to try out for yourself, prior to purchase. Over 130 miles and 14 hours later, I hope you got it. 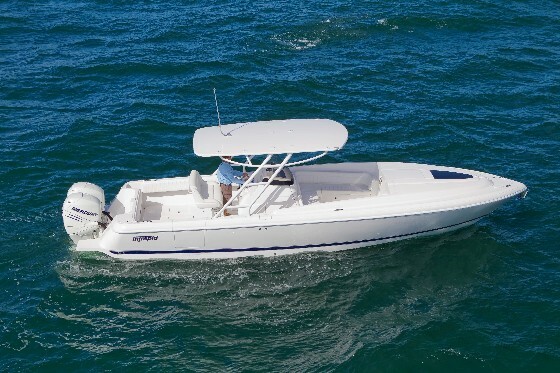 Other Choices: The Boston Whaler 420 Outrage has a much smaller cabin packed into an over-sized center console, but more deck space and fishability. 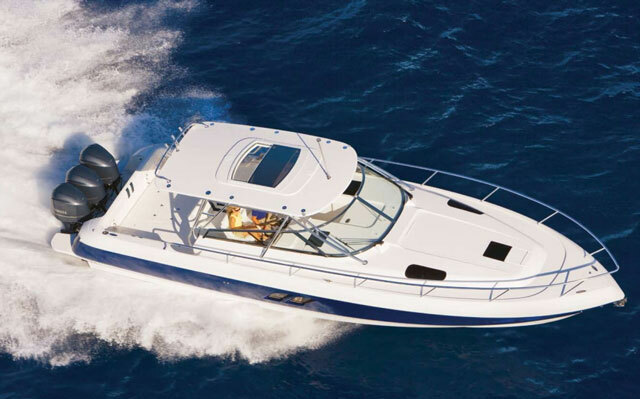 Same goes for the Sea Vee 430 Fish-Around, though it has more cabin (yet still less than the Intrepid). 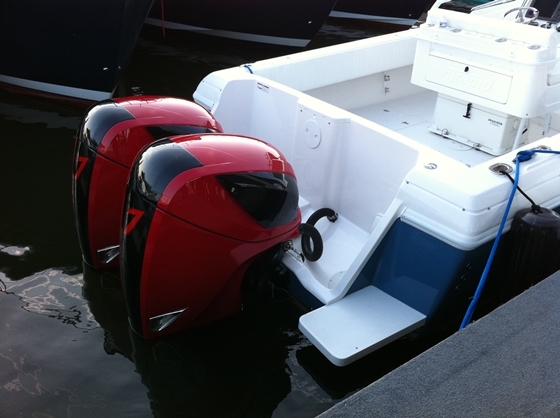 Both of these boats load a fourth outboard onto the transom. Test conditions: calm seas, winds 15 knots, 2 POB. 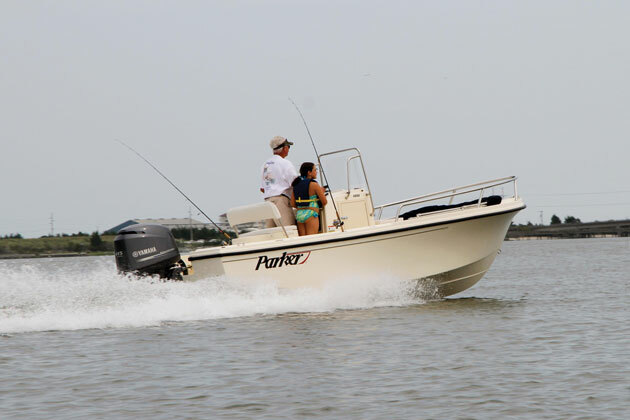 Power Triple Yamaha F350 four-stroke outboards, swinging two 15.25" X 21" three-bladed stainless-steel props.